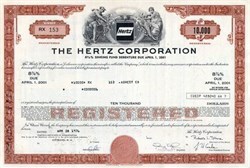 Beautifully engraved certificate from the Hertz Corporation issued in 1976-1977. This historic document was printed by the Security-Columbian Banknote Company and has an ornate border around it with a vignette of an allegorical man and woman sitting beside the company's logo. This item has the printed signatures of the company’s chairman (Robert L. Stone) and vice-president,finance and assistant secretary. This bond is over 34 years old. Hertz, the world's leading vehicle renting organization, is represented in over 140 countries, operating a fleet of 525,000 vehicles from approximately 6,500 locations. The pioneer of auto renting was Walter L. Jacobs who in September of 1918, at the age of 22, opened a car-rental operation in Chicago. Starting with a dozen Model T Fords, which he repaired and repainted himself, Jacobs expanded his operation to the point where, within five years, the business generated annual revenues of about $1 million. In 1923, Jacobs sold his car-rental concern to John Hertz, President of Yellow Cab and Yellow Truck and Coach Manufacturing Company. Jacobs continued as Hertz' top operating and administrative executive. This rental business, called Hertz Drive-Ur-Self System, was acquired in 1926 by General Motors Corporation when it bought Yellow Truck from John Hertz. In 1953, the Hertz properties were bought from GMC by the Omnibus Corporation, which divested itself of its bus interest and concentrated solely on car and truck renting and leasing. A year later, a new name was taken -- The Hertz Corporation -- and it was listed for the first time on the New York Stock Exchange. Jacobs became Hertz' first President and served in that post until his retirement in 1960. He died in 1985 at the age of 88. In 1954, the new corporation bought Metropolitan Distributors, a pioneer in New York truck leasing dating back to World War I and the largest concern of its kind in any one city. In the process, the head of Metropolitan, Leon C. Greenbaum, became Vice Chairman of the Hertz Board of Directors; he later became Chairman, and in 1960, Chief Executive Officer. In 1967, The Hertz Corporation became a wholly owned subsidiary of RCA Corporation and operated as a separate entity, with its own management and Board of Directors. In 1985, Hertz joined UAL, Inc. On December 30, 1987, Hertz was sold to Park Ridge Corporation, a company formed by Ford Motor Company and Hertz management, for the purpose of purchasing Hertz. In 1988, Volvo North America Corporation joined Ford and Hertz management as an investor in Park Ridge Corporation. In 1993, Park Ridge Corporation was merged into The Hertz Corporation. In 1994, Ford purchased the outstanding shares of Hertz and Hertz became an independent, wholly owned subsidiary of The Ford Motor Company. On April 25, 1997, Hertz became a publicly traded company, listed on the New York Stock Exchange, under the symbol "HRZ." Hertz is headquartered in Park Ridge, New Jersey. Its current headquarters location opened in 1988. Prior to that the corporation was based in New York and, before that, Chicago. Oklahoma City, Oklahoma, is the site of Hertz' Worldwide Reservations Center and Data Center, established in 1970, and its Financial Center, established in 1994. Car rentals, the largest and best known of Hertz' activities, are conducted from more than 1,600 domestic, corporate and licensee locations, and approximately 4,500 corporate and licensee locations outside the United States. Hertz offers a wide variety of current-model cars on a short-term rental basis -- daily, weekly or monthly -- at airports, in downtown and suburban business centers, and in residential areas and resort locales.